Ah, Escada, the masters of the simple fruity florals. Their fragrances are generally nice. The perfumes are certainly easy to wear, but I can’t help but notice how almost everything from Escada smells like the same fruity-floral dollop, up to and including Marine Groove. In Bottle: Big pineapple opening. There’s a lot of pineapple in this. It’s sweet and fruity, very tropical. I’m trying to find the passionfruit that’s supposed to be here but all I get is pineapple. Applied: Yeah, I don’t know who the notes list is trying to kid but there’s definitely pineapple in this and it’s very big. Marine Groove hits a tropical feel right away with its sweet, fruity opening. I’m not really seeing any other fruits but pineapple here and if there are other fruits, the pineapple’s pretty much got the top tier of the notes pyramid on this cornered. As Marine Groove ages into its mid-stage the pineapple settles down a bit and lets a benign set of jasmine and peony up. The mid-stage is marked with a light and airy floral quality with a coating of sweetness. This isn’t too sweet, just sweet enough to let you know you’re not supposed to take Marine Groove seriously. The dry down is a dull thud of clean, white musk. There’s not a long of longevity with this, or a lot of complexity. The projection on me was fantastic in the opening and then it just dissolves starting from the mid-stage and onward. Extra: Marine Groove was released in 2009 as a limited edition summer scent. There’s very little to set this fragrance apart from other pineapple dominant scents and if I had to pick between the sweet fruity pineapple in this and the sweet boozy pineapple in Black Phoenix Alchemy Labs’ Rangoon Riptide, Rangoon Riptide would win every time. 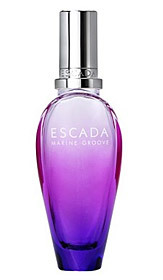 Design: Marine Groove’s bottle has the same design as most of Escada’s other bottles. That elongated heart glass bottle with the gradient colors on it. In Marine Groove’s case, we got reddish-purple gradiating into bluish-purple near the base. I still don’t like the way it looks and still think it makes the packaging look like a bottle of shampoo. Notes: Passionfruit, peony, jasmine, musk. Sheer, easy to wear, young, fun, nothing at all to judge in terms of complexity. Marine Groove is a summer scent through and through. Reviewed in This Post: Marine Groove, 2009, Eau de Toilette. This entry was posted in escada, floral, fruity, Reviews By House and tagged jasmine, musk, passionfruit, peony, pineapple. Bookmark the permalink. I bought this to my soon-to-be sister-in-law in 2009. She asked for something summery and cucumber-y which to me automatically equates to Escada and fruity-floral smells. 😀 So I got her this and she seems to love it still. Personally I find it too sweet. It also gives me an instant headache.